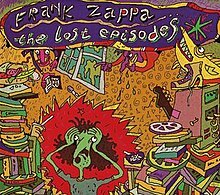 The Lost Episodes is a 1996 posthumous album by Frank Zappa which compiles (with the exception of "I Don't Want to Get Drafted" and "Any Way the Wind Blows") previously unreleased material. Much of the material covered dates from early in his career, and as early as 1958, into the mid-1970s. Zappa had been working on these tracks in the years before his death in 1993. The album is also notable for its five tracks which feature Captain Beefheart (known in early recordings by his birth name, Don Vliet, and later Don Van Vliet): "Lost in a Whirlpool", a blues parody from around 1958–59 in which Beefheart sings of being flushed down the toilet; "Tiger Roach", a rhythm and blues track from around three years later; "I'm a Band Leader" from 1969, a spoken word piece written by Zappa and read by Beefheart; "Alley Cat", a blues number in which Zappa plays guitar with two members of Beefheart's Magic Band, and "The Grand Wazoo", a spoken word piece recorded in 1969, to which Zappa added a Synclavier track in 1992 . Dan Glaister, writing in The Guardian, judged the first to be "a passable Bessie Smith cover", adding, "while "Alley Cat" could be a missing track from Clear Spot." Elsewhere on the disc are included a number of alternate, earlier versions of compositions which were later released on Zappa's studio albums. The Lost Episodes' version of "Any Way the Wind Blows", for instance, was recorded in Cucamonga in around 1963—three years before its appearance on Freak Out! (1966). And the version of "Fountain of Love" here was recorded around the same time, but not released until Cruising with Ruben & the Jets (1968). Several outtakes include the original versions of: "Inca Roads" and "RDNZL", along with a version of Wino Man featuring Ricky Lancelotti on lead vocals. The final track is the original version of Sharleena from the aborted 2nd Hot Rats LP recordings in 1970; featuring Sugarcane Harris on lead vocal. All songs written, composed and arranged by Frank Zappa except where noted. ^ Unterberger, R. "Lost Episodes - Frank Zappa | AllMusic". allmusic.com. Retrieved 22 July 2011. ^ Glaister, D. "The Captain Beefheart Radar Station - The Lost Episodes". beefheart.com. Retrieved 22 July 2011. ^ Woodard, Josef (8 March 1996). "The Lost Episodes Review | Music Reviews and News | EW.com". ew.com. Retrieved 17 June 2013. This page was last edited on 30 October 2018, at 17:39 (UTC).